Installation: Inside the train coach. Application: To feed the air-conditioning system of the regional railroad cars. The converter receives the high voltage (3000 Vdc) from the power line and converts it into a three-phase voltage (380 Vac 50Hz). An auxiliary voltage 24Vcc is required at the start up in order to feed the control circuits of the converter. In case of absence of the high voltage it is possible to feed the AC system directly from the local mains through a by-pass plug. The start mode (LOC-OFF-REM) can be selected on the front panel of the converter; in “remote mode” the converter can be started applying to the remote control connector 24Vdc voltage. A communication kit is available for diagnostics and supervising of the converter, through the serial interface RS422. The input filter absorbs the over voltage of the power line, limits the current and blocks the high frequency of the harmonic components. The DC/DC stage converts the input voltage 3000 Vdc into approximately 700 Vdc; this stage contains an IGBT inverter, driven by control techniques PWM – ZVS (Zero Voltage Switching), high frequency transformers that ensure the galvanic isolation, a rectifier bridge and the DC filter. 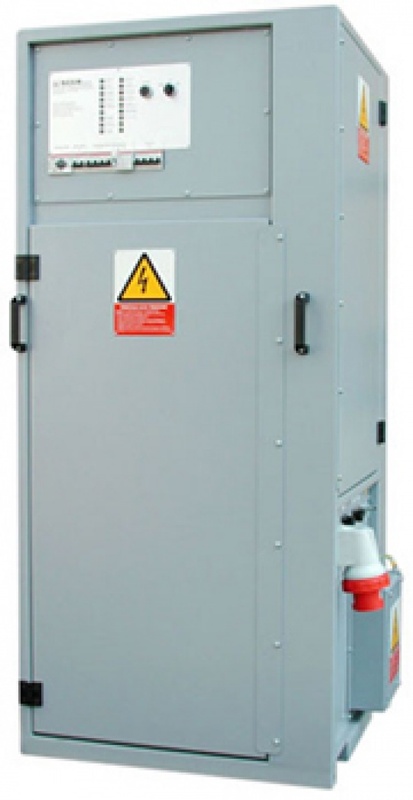 The Inverter stage converts the output voltage of the DC/DC stage into an alternate three-phase voltage. The output filter eliminates the high frequency harmonics, allowing only the 50 Hz components to go through.